Find artworks, auction results, sale prices and pictures of Mstislaw Valerianov Dobuzhinskii at auctions worldwide. MSTISLAV DOBUZHINSKY (RUSSIAN 1875-1957) Costume Design for Tin Soldier from Nikita Balieff's Revue "La Chauve-Souris" (The Bat), gouache on paper 38.5 x 18 cm (15 1/4 x 7 in.) initialed in lower center LOT NOTES In 1911, Russian impresario Nikita Balieff selected Leon Jessel's "Parade of the Tin Soldiers" for the choreography of his "La Chauve-Souris" (The Bat) vaudeville revue, changing the title to "The Parade of the Wooden Soldiers." The choreography referenced a legend about Tsar Paul I who allegedly left his parade grounds without issuing a "halt" order to the marching soldiers, so they marched to Siberia before being remembered and ordered back. 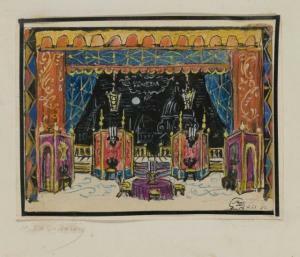 In December 1920 Nikita Balieff's "La Chauve-Souris" was successfully staged in Paris and in 1922 it was brought to Broadway. It returned to America to tour another 5 times in 1923, 1925, 1927, and 1929, with one final show titled as New Chauve-Souris in 1931. 5 names to the left of the soldier indicate the actors' names. The playbill for the 1927 Broadway production indicates Mr. Zotoff in the opening night cast. 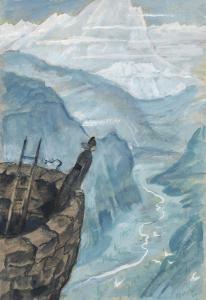 Mstislav Dobuzhinsky (1875-1957) Caucasian fortress signed and dated 'M Dobujinsky/1941' (lower right) pencil, watercolour and gouache on paper laid down on card 11½ x 7 7/8 in. (29.2 x 20 cm.) 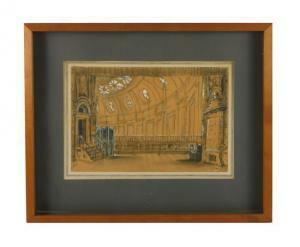 Provenance Anonymous sale; Sotheby's, London, 15 December 1995, lot 306. Acquired at the above sale by the present owner. 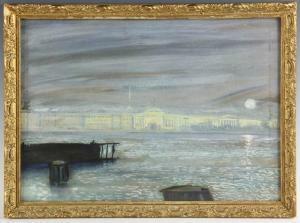 Mstislav Dobuzhinsky (Russian, 1875-1957), 'White Night, St. Petersburg', showing a view of St. Petersburg across the Neva River, watercolor and gouache on board, artist's monogram bottom left and bottom right corner, signed and titled verso, 16 3/4" x 12" (sight), frame 13 3/4" x 18 1/4". Provenance: Marino del Ray, California collection.